In Wiregrass Georgia, 1849 may have been the Year of the Tiger. Several previous posts have related the story of the Berrien Tiger, a large panther which attacked Jim Hightower (aka James Stewart, step-son of Thomas B. Stewart) near the Alapaha River in 1849 (see Eyewitness Accounts of the Berrien Tiger). Here is a family story shared by reader Lloyd Harris, of another “Tiger” encounter which occurred that same year near Argyle, GA, about 35 miles east of Ray City. When I was young my grandfather related a long ago memory of his grandfather’s encounter with a panther or panthers in the south Georgia wilderness. Our family story coincides with the Berrien Tiger accounts as they happened at approximately the same time. My great great grandfather, James Harris, told this story of his own childhood to my grandad when he was young. James Harris, 1880s. Image courtesy of Lloyd Harris. The incident happened when James Harris was about five years old, and coincides with the 1849 date of the Berrien Tiger. James Harris was the first of eleven children born to George Harris and Julia Ann Westberry. He was born near Quitman, Georgia, February 16, 1844. His father, George Harris, was the son of Thompson Harris (1784-1870) and Nancy Ursery (1784- ) A Confederate Widow’s Indigent Pension application for Julia Ann (Westberry) Harris in 1908 reflects George Harris’ birth in 1817 in South Carolina. Another source relates that he was born in Appling County, Georgia between 1817 and 1822, after which the family lived in Clinch County. George was a blacksmith and in addition assisted his father Thompson Harris in constructing covered bridges. His father’s work was known throughout Georgia, Alabama, and Tennessee. A trademark of their bridges was the integrated use of iron and bored wooden pegs to hold the timbers together. George was a blacksmith and wheelwright. Family tradition relates that he assisted his father Thompson Harris in constructing covered bridges throughout Georgia, Alabama, and Tennessee. The church records of Union Church show that George and Julia Harris were received and baptized into its membership August 7, 1841, and were dismissed by letter March 12,1842. They became members of Providence Primitive Baptist Church near their home soon after that church was constituted in 1844. Their subsequent records cannot be traced due to the loss of church records. The Harris home and farm in Clinch County, Georgia was on lot 325 in the 7th District which lot was traversed by the county line between Clinch and Ware Counties when Clinch was created in 1850 from Ware County. This property is situated about three miles north of the present village of Argyle. George Harris was granted this lot from the state on June 3, 1849; also granted the adjoining lot 324 on October 3, 1848. He sold lot 324 to his brother, William Harris, November 2, 1849, and then lived on lot 325 until he sold that parcel of land to Richard Bennett on August 12, 1852. There is a family tale handed down through many generations relating to frontier life. The event happened in 1849 during the time the Harris family was residing in Clinch County. George Harris was away leaving his wife Julia and the children home alone in a pioneer homestead. Speculation would be that he was away with his father building bridges or hunting. During one night panthers roaming from the nearby Okefenokee swamp menaced the home ranging closer and closer to the cabin. To keep the predators from entering the home the frantic family prayed through the night and burned their beds, and chairs keeping a large fire going. The tactic flushed the space with light and served to repel an attack by the curious cats. The Harris family story of a young pioneer family praying, hanging blankets over windows, and burning the bed, tables and chairs was passed down serving to entertain several generations with a true historical drama of frontier Georgia living in the nineteenth century. George Harris and his son James both served in the War Between the States. George Harris enlisted as a Private in the fall of 1862 as a member of the 3rd Cavalry Battalion which was formed during the winter of 1861-1862 with six companies. He along with his unit served on the Georgia coast, scouting and patrolling, until a reorganization of troops occurred on January 1, 1863. George Harris’ unit was merged into the 4th (Clinch’s) Georgia Cavalry Regiment , and he was placed in Company I. Lieutenant Colonel Duncan L. Clinch and Major John L. Harris were in command. At the reorganization, James Harris joined his father’s unit, Company I, 4th Georgia Cavalry as a private. He participated in the Battle of Olustee, Florida and in the battles around Atlanta. Family tradition relates he contracted measles during the siege of Atlanta and was in the city when it fell to the Union armies under General William T. Sherman. His unit apparently left him outside of the city but in the line of the advancing enemy soldiers. James was convalescing on a farm (place unknown) when “Yankees” were seen approaching. He was hidden by the host family in the stump of a huge oak tree that had “bushed” up. James remained concealed in the oak bush throughout the hot summer day until the Yankees left. Though suffering from sickness, and within a stones throw of the Union soldiers, he remained quite and motionless evading capture! Records also indicate he participated in battle at John’s Island, South Carolina. He surrendered at Thomasville, Georgia and was paroled at Tallahassee, Florida on May 15, 1865. 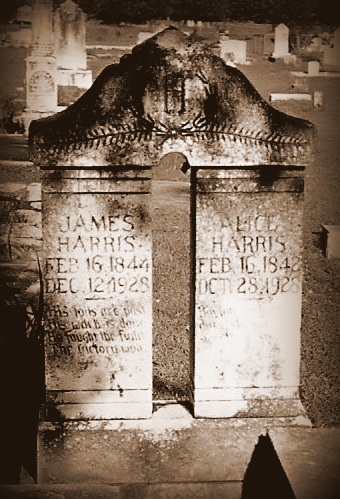 After the war James Harris married Mary Alice Stone. She was born February 16, 1842, the daughter of George W. R. Stone and Nancy Howell. The Harris and Stone families are listed in the 1850 Census of Ware County. James and Alice raised a family and engaged in farming near Adel, GA in present Cook County. He was a skilled blacksmith and wheelwright, as well. James Harris is listed in the 1880 and 1900 census of Berrien County, Georgia. For James Harris, 1897 was a particularly trying year. That summer a hailstorm hit the Harris farm, damaging his house and property. 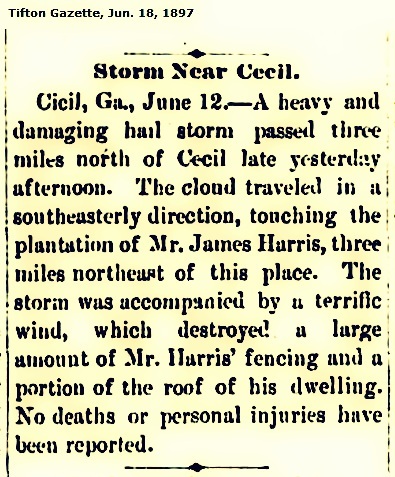 James Harris’ plantation hit by storm, 1897. Cicil, Ga., June 12. – A heavy and damaging hail storm passed three miles north of Cecil late yesterday afternoon. The cloud traveled in a southeasterly direction, touching the plantation of Mr. James Harris, three miles northeast of this place. The storm was accompanied by a terrific wind, which destroyed a large amount of Mr. Harris’ fencing and a portion of the roof of his dwelling. No deaths or personal injuries have been reported. 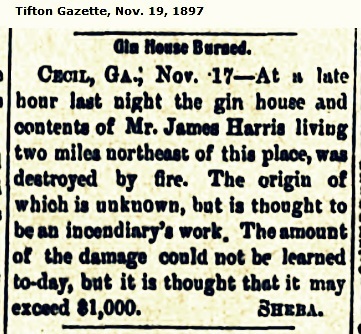 In November, 1897, Harris took another blow when his gin was burned down. James Harris’ gin house hit by fire, 1897. Cecil, Ga., Nov. 17 – At a late hour last night the gin house and contents of Mr. James Harris living two miles northeast of this place, was destroyed by fire. The origin of which is unknown, but is thought to be an incendiary’s work. The amount of the damage could not be learned to-day, but it is thought that it may exceed $1,000. SHEBA. 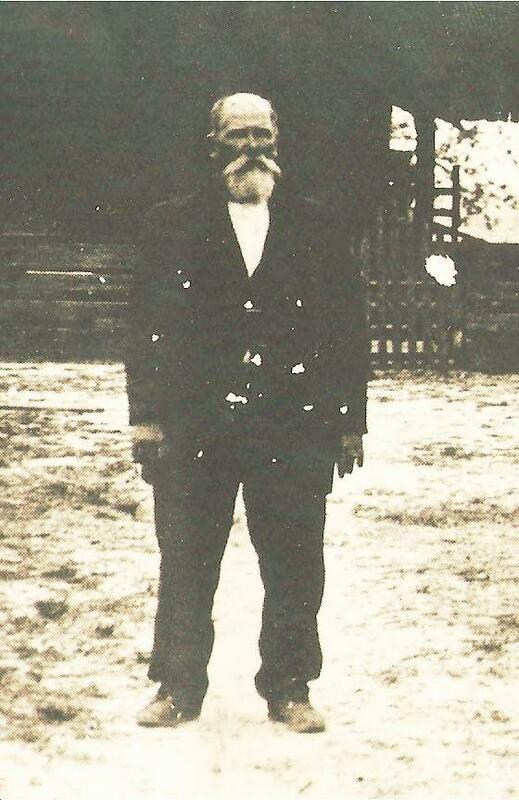 James’ father, George Harris, died between 1892 and 1894 in Echols County, Georgia. His mother, Julia Ann Harris, applied for a Confederate Widows pension in 1908 and 1909 in Berrien County, Georgia. George Harris and his wife are buried in Union Primitive Baptist Church Cemetery in Lanier County, Georgia in unmarked graves. 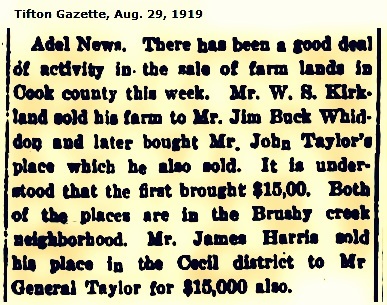 In 1919, James Harris sold his farm near Cecil, GA.
James Harris sells out in Cecil District, Georgia, 1919. Adel News. There has been a good deal of activity in the sale of farm lands in Cook county this week. Mr. W. S. Kirkland sold his farm to Mr. Jim Buck Whiddon and later bought Mr. John Taylor’s place which he also sold. It is understood that the first brought $15,00. Both of the places are in the Brushy creek neighborhood. Mr. James Harris sold his place in the Cecil district to Mr. General Taylor for $15,000 also. James Harris was a resident of Cecil, Georgia in Berrien/Cook County until his death. He died in Adel, Georgia December 12, 1928. Alice died October 28, 1928, in Adel Georgia. They are both buried at the Fellowship Baptist Church Cemetery in Cook County near Cecil, Georgia. Special thanks to Lloyd Harris for the contribution of images and content for this post.